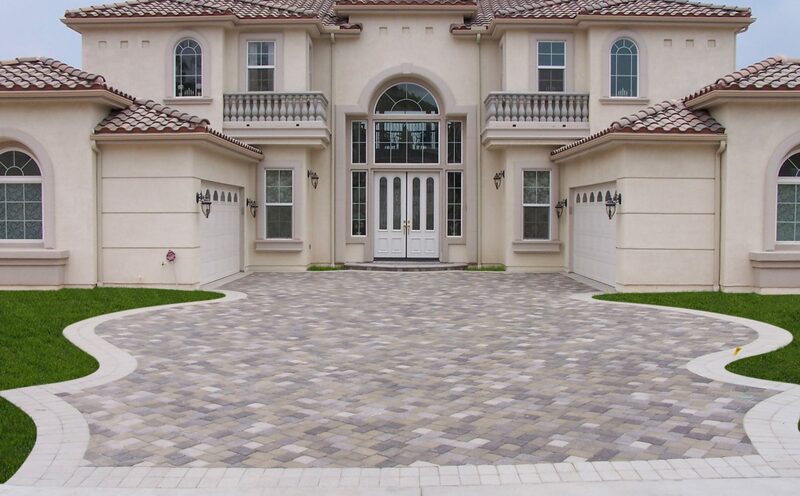 As a design and installation company, Genesis sees a lot of driveways. We recently just hit our 10,000th job! Most of those hardscape projects incorporate manufactured concrete pavers, but every once in a while we meet a customer who wants something different, natural stone paving. Man-made concrete paving stones offer thousands of color combinations, 8000 psi pressure ratings, and nearly a dozen local manufacturers. However, natural stone can offer a different aesthetic than man-made stone, to dramatically change the feel of a property. Depending on the type of traffic in the paved area, different kinds of base must be used to protect the stone from cracking in the future. High load areas, such as a front driveway where cars are frequently parked, should be installed with a concrete slab under the natural stone. This slab protects the brittle natural stone from pressure by vehicle tires. Light load areas like a back walkway can be sand-set. The time saved in sand-setting shows up in the final cost of the project. Some types of stone are more resistant to fading in sunlight than others. If a stone doesn’t take sunlight well, then consider sealing the paved area with an UV protective sealer. Most stone sealant today offers UV protection, and also give a high gloss finish to the driveway or patio. Sealant also protects against most types of staining, and some can even protect the stone from scratches by patio furniture. Driveways can take stains from tire rubber when a driver aggressively maneuvers on the stone. Some types of sealant can even help remove these rubber stains. A lot goes into recommending stone pattern and color for a new patio or driveway. Professional designers take into consideration house color, landscape color, seasons of use, and albedo (solar reflective-ness). The end result can be an absolutely stunning driveway or patio. I highly recommend letting a hardscape designer sharing their expertise in color theory. Every paved area should incorporate a drainage plan. Poor drainage can lead to water damage inside the home, soil erosion in the yard, or worse: damage on a neighbor’s property. Great drainage plans can lead to water savings year round by collecting run-off in water barrels for use in landscaping. Here in Southern California, the seasonal rains can shock the landscape with sudden rains and mini flash-floods. Genesis has been in the game for over 20 years, and understands how important ‘a little water’ can be. That’s why drainage made this list, every landscape and hardscape project should incorporate a drainage plan. Check out some of our photos for inspiration. Most of our work is manufactured stone, but there’s a few natural stone features in our gallery. Click the following links to view the corresponding galleries by category: driveways, patios, walkways. Also, view this collection of patios incorporating natural stone with manufactured stone at 5 Concrete Patio Designs that Rock (Literally). Call us today to request a free estimate at 888.389.5533, or visit our free estimate page. We offer a wide range of design expertise from interlocking paving, to artificial turf, and even landscape design drawings. Make sure we’re on your bid list for the next hardscape project! Although it may not be the first thing on your mind when you plan your new paver patio, drainage will greatly impact your ability to enjoy your new living area. Drainage is the natural or artificial movement of surface or sub-surface water. Without proper drainage, water can roll back on your foundation, causing erosion. Standing water can breed insects and ruin landscaping. It can also cause a paver patio to subside, throwing the entire area out of level. There are a number of ways you can drain the water from your patio. NAC eye drops recently posted…No last blog posts to return. Natural paving stones look really classy and stylish. I also prefer them as compared to the concrete ones.